Cuba has a long list of must-see attractions and experiences. If you want to take a step back in time while experiencing the vibrance of modern Cuban culture, the historic Plaza de la Catedral would be a great place to start. The “plaza mayor” is a common meeting place in many Latin American countries. Plazas are gathering places for townspeople to socialize, conduct business and keep a pulse on current events. 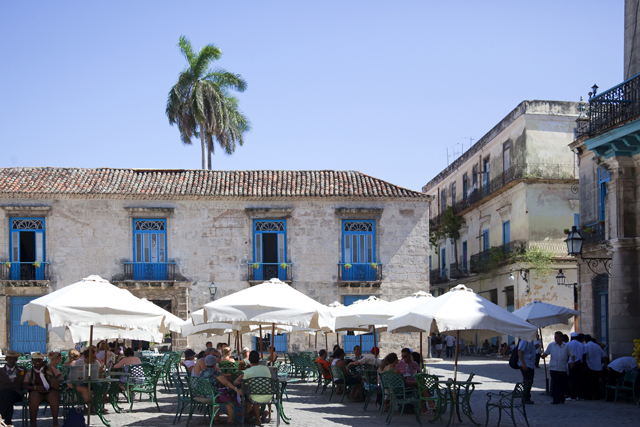 This social phenomenon still exists in the New World and gives many places in Havana an open-air living room feel through the plaza structure. With strong roots in Spanish architecture influenced by baroque design elements, the Plaza de la Catedral is anchored by the Havana Catedral. Previously, the site of the plaza was a swampland called Plaza de la Ciénaga. Eventually, the grounds would be drained and became suitable enough for construction. Large majestic structures such as the famous Cathedral and mansions for Cuban aristocrats would be built here over time. 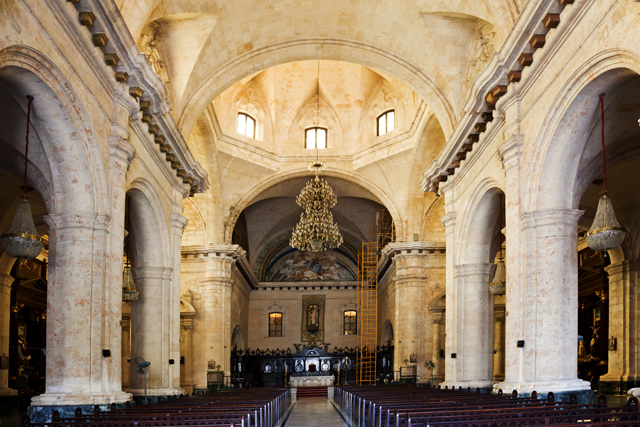 One of the Plaza’s most popular attractions is the Havana Catedral church. The building’s construction lasted almost 30 years, starting in 1748 and ending in 1777. The unique features of the Cathedral include asymmetric bell towers and preserved marine fossil imprints in the coral facade. It is rumored that the church once housed the remains of Christopher Columbus and is sometimes called the Cathedral of Saint Christopher. The cultural significance of this historic site also preserves some of Cuba’s largest, most magnanimous structures that were once homes to Cuba’s social elites. These The large mansion-style homes now serve as historical landmarks and museums. El Patio Colonial, a popular Cuban restaurant in the Plaza, is located in Casa de los Marqueses de Aguas Claras which was once inhabited by a descendent of Ponce de Leon. Across from this restaurant is the Casa de Lombillo which housed the first Cuban post office. This build now serves a literacy museum. To the south of the Plaza, you’ll see Casa del Conde de Casa Bayona which is now the Museo de Arte Colonial. Finally, there is Casa de los Condes de Peñalver which now functions as one of Cuba’s premier art galleries. Though the plaza is anchored by these impressive feats of architecture, the charm of this town square can also be experienced in other ways. The exciting hum of activity in never ending. You’ll always see or hear something uniquely Cuban while there. A great place for people watching, you might see young lads kicking around a soccer ball or street performers engaging in all types of entertainment. It’s not uncommon to hear live music wafting through the streets, bars and restaurants around the Plaza. Then, there are the Cuban women adorned with vibrant colonial clothing and headdresses who will offer to tell your fortune or take a picture with you. No matter when you come to Plaza de la Catedral, you are sure to find plenty to do and see in this famous, historical site. 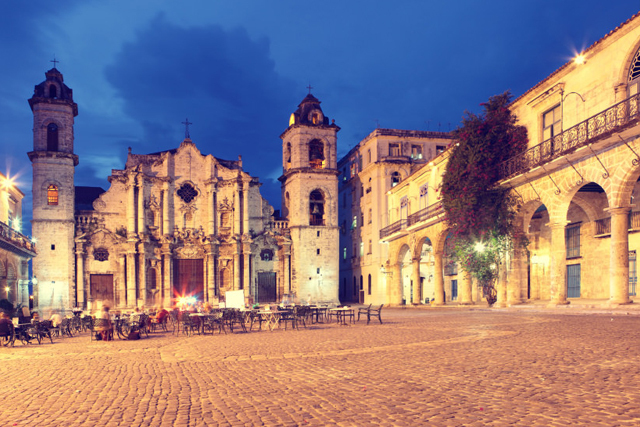 Plaza de la Catedral is a featured stop on many of our insightCuba tours. 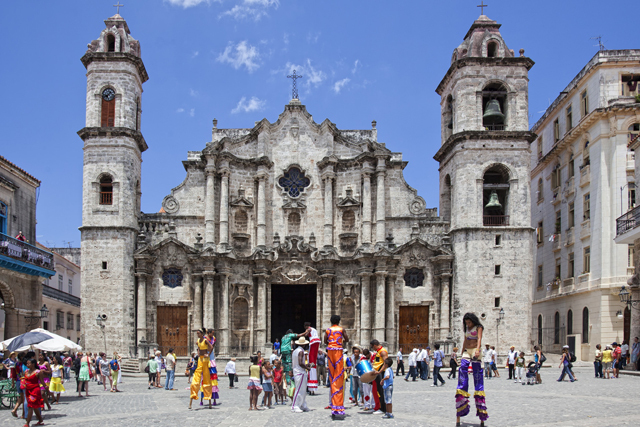 Find out more about the insightCuba itineraries that include the Plaza de la Catedral so you can experience it for yourself!